...is the color of the frosting. Sad. And here's a question--why is green associated with St. Patrick's Day anyway? Anybody? Bueller? Bueller? I make no bones about the fact that I'm extremely uncreative, and this is just further proof of that. I wanted to make something for St. Patrick's Day and use my sourdough starter (known fondly as Eb) at the same time, and this is the best I could do. Meh, whatever. The end result is delicious. And speckled. AND if I happen to forget to wear green today, I can just smear some frosting on my face and avoid getting pinched (and have a snack for later). Preheat oven to 350F. Line muffin tin and/or spray loaf pan(s). In a large bowl, whisk together the oil, sugar, egg, bananas, sourdough starter, and vanilla. In a smaller bowl, combine the flour, salt, baking powder, baking soda, and cinnamon. Add the flour mixture to the wet mixture, stirring just until blended. Fold in the chocolate and spoon into muffin cups (or loaf pan). Bake for about 20 minutes (30 minutes for mini loaves) or until a toothpick comes out clean. Matthew Broderick is soooo cute. Tee hee. If only he'd bring me one of these cupcakes, what a good St Patty's day it would be! It's gorgeously green! There's not nearly enough excitement in Austin for St. Patrick's Day, and I didn't even make anything green. You are so funny! I often use Ferris Bueller references... LOVE that movie! Bueller, Bueller. I love that movie. The cupcakes look great - my kids would really dig them. Ha! We love that movie! Now I'm going to be singing "Twist and Shout" all day! Your green peanut butter frosting doesn't look sad at all! And the colorful insides are so fun! YUM! Looks yummy to me! Bananas, chocolate and peanut butter; the basiic food groups are here! Frosting on your face - yes, that sounds like a good idea to me. :) Looks like I'm just going to need to get an Eb of my own. 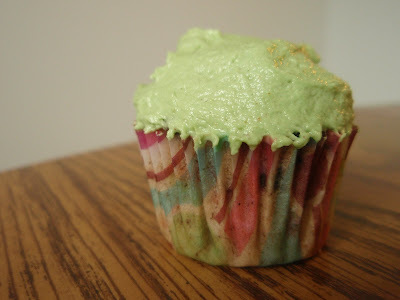 I believe my St. Patrick's Day baking will consist of green food coloring in a yellow cake. You gave it more effort than I will, but maybe I'll go for green frosting, too. Those cupcakes look wonderful Grace a lovely green colour! oooh I once made a peanut butter frosting very similar to this recipe, thanks for posting and reminding me. I love the peanut butter and banana combo! I always just figured that green is Ireland because Ireland is SO freaking green!!! And I know that the green represents the Irish catholics in Ireland, while the orange is the protestants (aka Northern Ireland). Which is why the flag is green, white, and orange. The white is supposed to be peace between the two. Emerald Isle and all that jazz, like in the Pacific Northwest where things just turn green if you leave them outside long enough. I've always been a little green-challenged myself. I think you earned an A just for trying and a + because it tastes good! I think green is associated with St. Patrick's Day because Ireland is the Emerald Isle? Green? I have a cold and I am not really thinking that clearly so maybe just ignore me. You're such a liar. You're totally creative! Who else would have thought of rainbow banana bread cupcakes? Love the green frosting-especially on your face. Good job with the cupcakes. Wish I had some sourdough starter. Maybe when I get back to Lake Lure I'll get a sponge going - isn't that what you do? Will have to research. I love Ferris Bueller, such a great movie! The cupcakes look most delicious! I don't know about the green but the local radio station said originally St. Patrick had the color blue associated with him. Lets just say I love that movie, and I am actually surprised that for your age you know this movie....The cupcake is simply divine my dear. Where were you with all these recipes BEFORE I killed my sourdough starter?? Oh thaty Eb! He does such a good job of making everything you put him in look good! Ireland is the Emerald Isle, they say there are 40 shades of green in its hills.Happy St. Paddy's Day to you. Glad you were able to celebrate!! Green peanut butter frosting must be an unexpected treat. Something that Bueller would certainly have approved of. Your post is plenty irish enough for me. Had no idea Matthew Broderick was Irish. Happy St Patrick's Day! "anyone? anyone? "..You're so funny. Happy St Paddy's kiddo! I love how colorful it is on the inside, what a fun surprise! Green enough for me! I have green eys so no one dares to pinch me. I once read that it was because Ireland is full of green pastures and forests... But not sure, though. can you please stop making all these muffins, over and over? Please? Your wonderful muffins are killing me and making me crave them at odd hours of the night and day--even just seeing the empty muffin wrappers are killing me too. thank you! Seriously Grace this is adorable...I love it! I am so jealous of your starter. I recently started a starter but is ended up in a dried clump. Ugh. I will try again when it gets a bit warmer. Of course then I wont want to bake. I love the color of these!! Love that green. They look delicious. This would be hard to resist, green or not. Your posts are too funny, I love coming here. These sound and look great! You've provided me with yet another delicious recipe using sourdough starter :). Yum! This bread looks fabulous! Oh man, I wish I could have a slice right now! With such a healthy sour dough starter, you never need to apologize! I was wondering the same thing, especially after I read somewhere that St. Patrick's favorite color was blue. My husband thinks green is the St. Patty's color because Ireland is called "the emerald island." I love colourful desserts. It seems to make them even more delicious. I sadly didn't even get into the St. Patrick's day spirit enough to wear green. At least your tried! From Ask.com: Green is associated with Saint Patrick's Day because it is the color of spring, Ireland, and the shamrock. I love the addition of the M&Ms. Great Idea! Mmm rainbow banana bread makes me hungry. I almost missed this post!! I would have hated myself. This looks out of this world delicious! MMM, and peanut butter frosting, You are AWESOME!! I'm so surprised that you didn't string them all together, wear them around your neck with a sign on your back that said "bite me I'm Irish"
So funny! When I looked at the photo my tastebuds did that wonky thing because I thought I was looking at blueberries and cranberries. M&M's? Hahahahahaha! Sounds yummy. And at least you made something green for St. P's day. I pulled clover out of my flower pots. w00t! I love that movie! I love M&M's! This would be a perfect dessert for me! 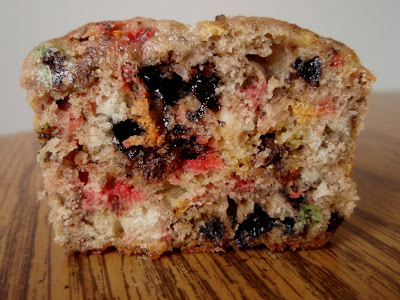 wow, rainbow banana bread?! love it!! So festive! Happy St. Patrick's Day! That banana bread sounds really good! Love bananas and chocolate (and m&ms...why not?) --that bread looks fantastic! gosh, you have high standards for creativity ... i think this is incredibly creative. I love the idea of a non-quick banana bread if that makes sense.